Schoenstatt Sisters of Mary work in a variety of pe- dagogical fields. In Karnataka, Bangalore, the Sisters have their own schools. 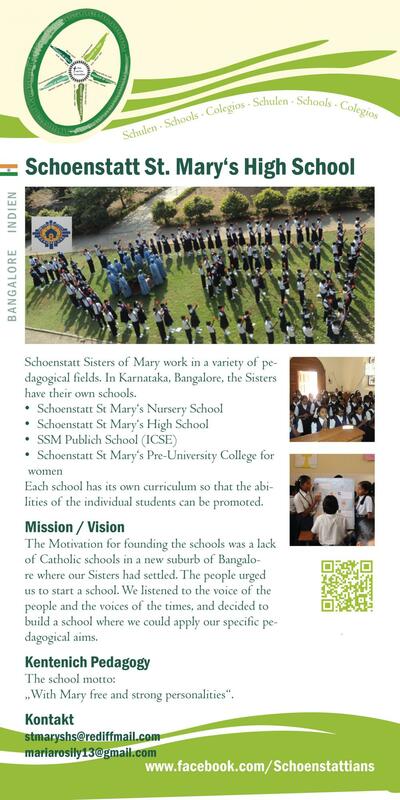 • Schoenstatt St Mary‘s Nursery School • Schoenstatt St Mary‘s High School • SSM Publich School (ICSE) • Schoenstatt St Mary‘s Pre-University College for women Each school has its own curriculum so that the abi- lities of the individual students can be promoted. The Motivation for founding the schools was a lack of Catholic schools in a new suburb of Bangalo- re where our Sisters had settled. The people urged us to start a school. We listened to the voice of the people and the voices of the times, and decided to build a school where we could apply our specific pe- dagogical aims. Kentenich Pedagogy The school motto: „With Mary free and strong personalities“.